Plastic Garbage Bins Exporter – Fatorda,Margao, Goa. 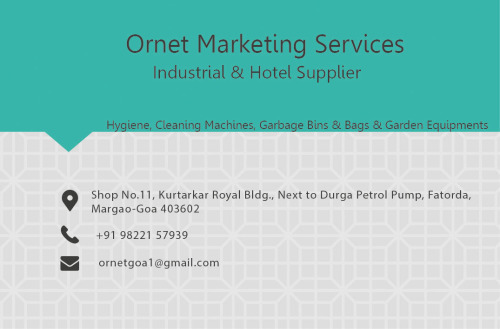 Ornet Marketing Services is a trader of Vacuum Cleaning systems, Garbage Bins and Hygiene Products in Margao, Goa. Our product range includes variety of other Cleaning Machines like, High Pressure Machine, Vacuum Cleaner Wet and Dry, Vacuum Cleaner Jags, High Pressure Machine Jags, Scrubbing Machine TSM-Durashine, Scrubbing Machine Jags SB-43 Plus and many more items. In Garbage Bins we have different kinds of mounting system such as, Wall Mounted Bin without Pole, Wall Mounted Bin with Pole, SS Plain Pedal Bin, Big Belly, Big Belly Dustbins, Round Lid, Flat Boy Bins and many more. Contact Ornet Marketing Services for PVC Strip Curtains, Automatic Hand Driers, Vacuum Cleaners, Auto Urinal Flusher System in Margao, South Goa, Goa.